I have a million things I want to talk to you about, but my brain in overdrive right now, I can't get my thoughts together. I want to talk to you about my London trip, a funny thing that happened to me the other day, a word someone said that completely grossed me out, but I'm running around like a chicken with my head cut off. I have my culinary school practical finals this week with the theory portion looming in its shadow, my husband is super busy covering the FIFA Women's World Cup this month, so I'm essentially a single parent (please, no disrespect to those amazing parents that do this on their own ALL THE TIME. I celebrate and salute you! ), my littles have extra-curricular activities that are also winding down with recitals, swim meet finals, and soccer game championships. This is not a whine or whinging moment; I'm simply letting you know that I so want to talk to you, but life is taking over. However, if you bear with me, I'll make it worth your while soon enough. But for right now, I hope this insanely delicious Manchester Tart will hold you over. I mean, a girl's still gotta eat, right? Even if it is all desserts, all the time. We'll worry about calories another time. In a mixing bowl, cream together butter and sugar until smooth and creamy. Beat in egg. Whisk flour and baking powder together and add into butter mixture only until incorporated. Press dough into tart pan with removable bottom. Blind bake for 15 minutes. Remove from oven and allow to cool. Once cool, warm raspberry jam to a spreadable consistency and apply generously over the entire base of crust. Top with banana slices. A traditional Manchester Tart has been debated over whether to use bananas or not. I've had it both ways and I personally love the bananas and feel they deserve their place in this tart. I mean bananas + custard = LOVE. Once assembled, set aside. In a heat safe bowl, whisk together egg yolks, sugar, and cornstarch to a thick paste; set aside. In a heavy saucepan, scald milk and heavy cream. Temper eggs by VERY SLOWLY adding milk to egg mixture while constantly stirring. Once you've poured about a half the milk into the eggs, pour the mixture in the heat safe bowl back into the saucepan and apply medium heat. Add vanilla extract and custard powder. Whisk constantly until custard gets very thick. This could take upwards of 15 minutes. It needs to be thick so it can be cut into once it solidifies. Pour custard over bananas and jam. Smooth over with an offset spatula and top with desiccated coconut. You can toast the coconut if you so desire. Place tart into fridge for at least 4 hours to allow custard to completely set. 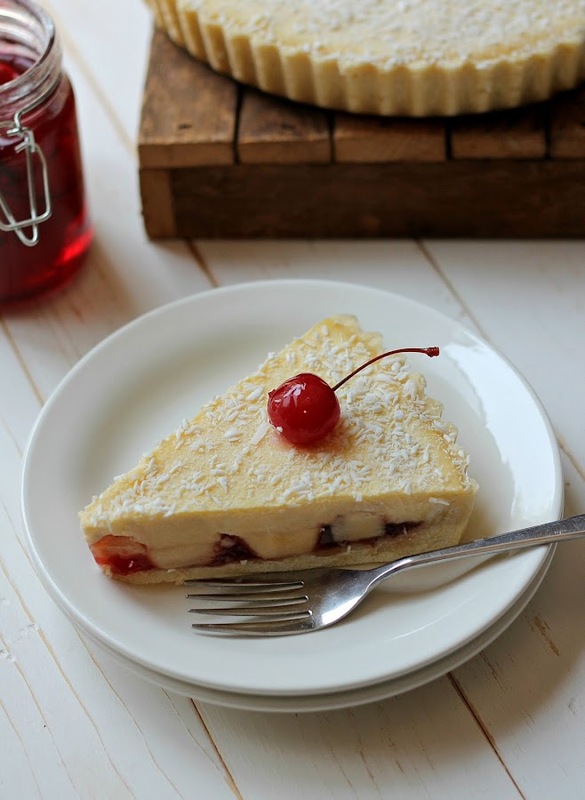 Once ready to serve, slice and top with a maraschino cherry. Keep any uneaten portion of the tart covered and refrigerated. It's completely understandable that life gets in the way. . .but as long as you have this divine Manchester tart. . .everything is going to be A-Okay. Good luck with your finals! 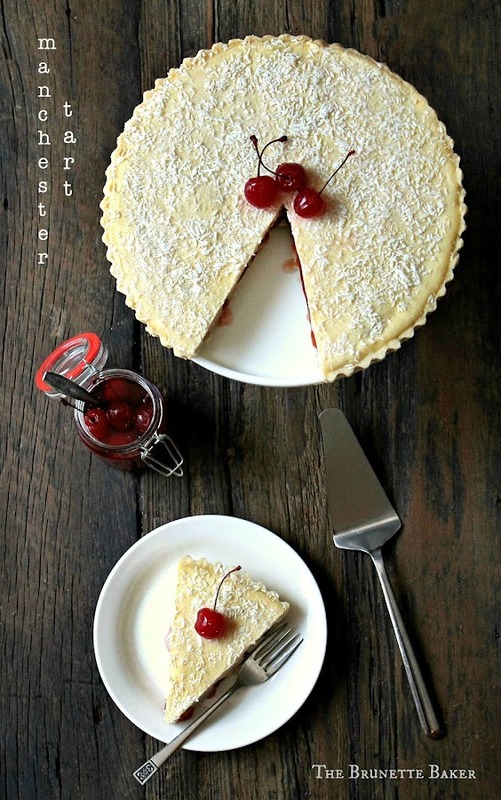 :) And this tart looks awesome, never heard of Manchester tart but the flavors in it sounds delicious! This is gorgeous! I love custard and this is right up my alley. Thanks for sharing! I need to make this this weekend. My family would flip. Can I use all custard powder? Just found this on Pinterest. I think I'm in love! I made this tart this past weekend and it was AMAZING! We left out the bananas because my husband thinks bananas should only ever be eaten on their own, but I think they would have been so good. New favorite go to dessert! Thank you! I made this tart for a dinner party and it is INCREDIBLE!! I've been looking for a cooked custard tart and I finally found it. loved the bananas and jam with it. It was a pretty dessert to serve too. I love your blog and I'm so with you on the drummer thing and the McDonalds, especially their fries and ice cream. Musicians totally do it for me every time. LOL. This is the first proper recipe for REAL Manchester tart iv seen!!! most don't include the banana. It's not a manchester tart if it doesn't have the banana.